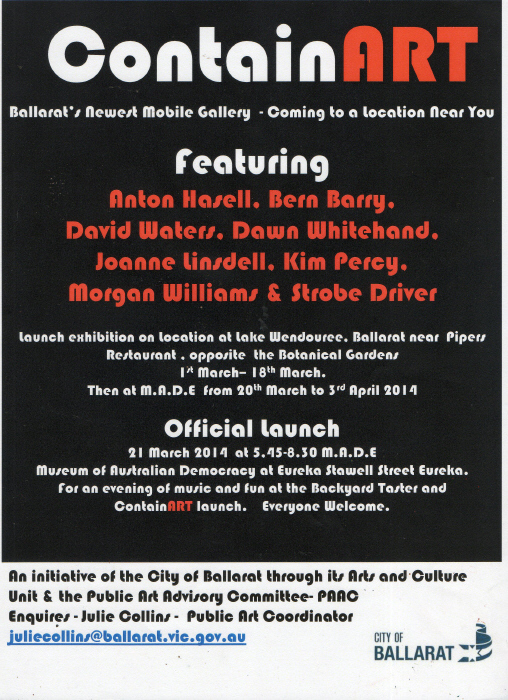 The latest public art initiative to emerge from Ballarat City Council is ContainArt, a mobile gallery that will house changing exhibitions and tour around Ballarat and the surrounds bringing art to people who may not usually have access to it – either because they don’t frequent formal galleries or due to where they live, IE rural areas. This is a great idea because it brings art TO the people, rather than people having to go TO the art! This was proven correct this afternoon as, while taking the photos for this post, I witnessed many people stopping, looking, walking around the container, pointing and talking to whomever they were with. I was lucky enough to be selected as an exhibiting artist in ContainArt’s inaugural show, and yesterday was install day. There are also five other artists exhibiting, including my (new) hubby Strobe – he took the photo of his art piece while we were on our three day honeymoon – the mini-moon!. The gallery itself is an old shipping container fitted out on the inside with display boxes that face outward and solar electricity for lighting. The display boxes are quite large providing artists with lots of scope to exhibit multiple pieces or just one large piece – which is what I did! 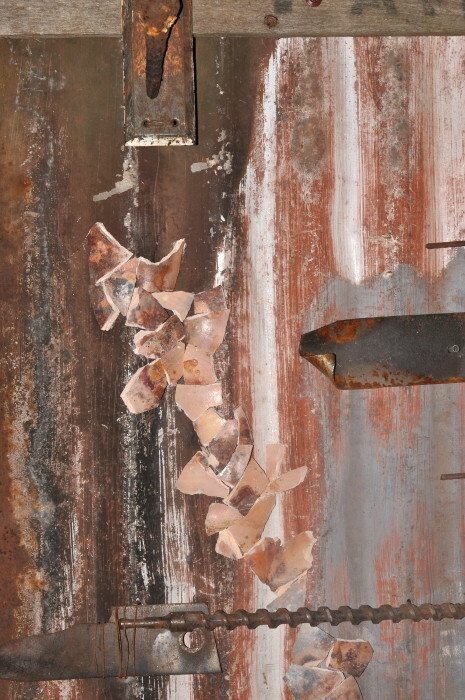 My artwork is a mixed media piece using found objects, both organic and manufactured, and ceramic shards. Entitled Scattered Urban Memories, it is the largest work I have ever made (approx 1 x 2 metres), and therefore was challenging yet satisfying. Yay…. a passer by is looking at my artwork!! I spend lots of time collecting things from heavy clunky railway studs through to light delicate feathers – and both of these objects found their way into the work along with many others. While making the work during the past week I did post a couple of sneak peeks on Facebook and Twitter– following me on these networks is a great way to stay updated on the daily going ons of my art making, sometimes crazy, world. The other artworks in the show include painting, ceramic sculpture, foam sculpture, recycled works and photography – this mix of materials and perspectives combine to produce an interesting and fun show. 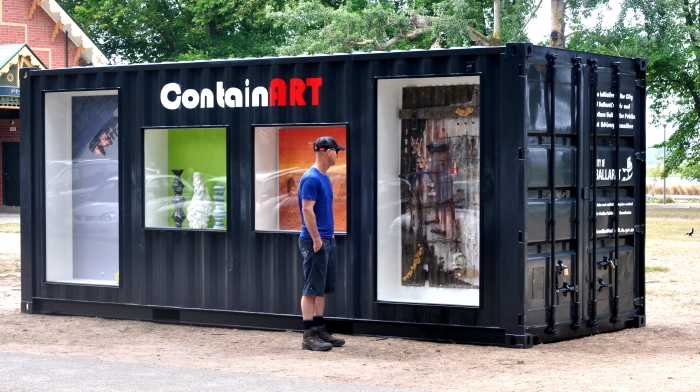 The show is currently at Lake Wendouree until the 18th March, then will move to MADE (Museum of Australian Democracy at Eureka) where the official launch of ContainArt will take place on the 21st March. The exhibition will remain at MADE until the 3rd April… and then it will be a new round of artists at a set of destinations! « February and March are WAY to BUSY! Dawn, this all looks spectacular – from the execution of the artwork through the installations! How exciting to be part of an art initiative like this – congrats!! Thanks Patricia…. yes it is a great concept!